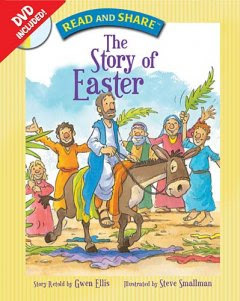 I just received a complimentary copy of Gwen Ellis' Read and Share- the Story of Easter from BookSneeze to review. I signed up for this particular book because it looked appropriate for my three year old son and I've wanted to teach him the really meaning of Easter and Jesus Christ's ministry. This book is illustrated by Steve Smallman and has nice, age appropriate pictures. The writing is very easy to follow and understand- I think it would be appropriate for preschool through elementary age children. My son also liked the DVD with so many great bible stories, but I preferred reading it to him so we had a chance to talk about the beautiful message. My favorite part of this book was the "you can retell the story" pictures at the end of the book. My son loved telling me what happened and I loved seeing how much he had learned. This book was a great and I look forward to reading it again and again with my children.